The Daily Catch is spot-on. It delivers what it promises (and little else), but the squid ink pasta on their calamari-driven menu is incomparable. Housemade, it’s likely the best these lips have ever tasted. With serious chew, mellow squid ink flavor and thick, slurpy noodles, I get it every time I go…which is often. You get three choices to dress your black linguine: a tangy puttanesca, a thin alfredo sauce that I think lacks heft (and is easily amended by adding extra Parmesan cheese), or their signature aglio oilo–a chopped squid and garlic olive oil sauce. You can’t go wrong with any of the three. The rest of the menu is good, but perhaps not as great. They have native seafood of all sorts like shrimp scampi, Cherrystone clams on the half shell or Littlenecks in a linguine vongole, mussels marinara, broiled haddock, quirky sides like calamari meatballs, and you can order any of their entrées over pasta with your choice of red or white sauce. Groups often opt for the lobster fra diavlo for $70; I haven’t tried it yet, but it looks like a seafood lover’s dream chock-full of a 1 ¼ pound lobster, clams, mussels, shrimp, and of course, squid. Skip the salads as they are unimpressive, but hope there might be a side of garlic broccoli on the menu when you go. With three locations across the region, the tiny joint in Boston’s North End is by far the best. 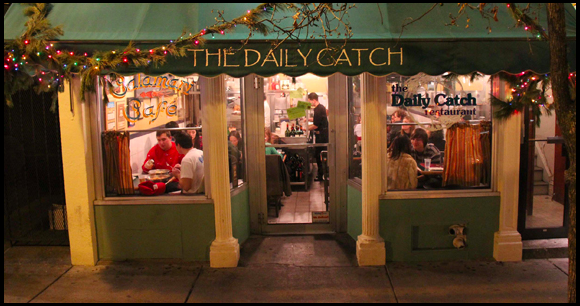 An authentic slice of Little Italy relying solely on a handwritten, hanging chalkboard menu, The Daily Catch is a real-deal hole-in-the-wall, so be prepared to wait for a table and smell like garlic when you leave.